TASK LOVES YOU. We just have a funny way of showing it. 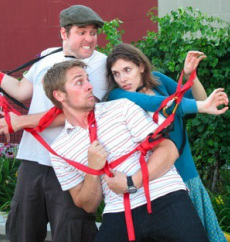 TASK is a clown theatre troupe made up entirely of the parts of Diane Mair, Jeff Trainor and Tim Simeone. Our mission is simply to complete the TASK. It should be easy. It looks easy, right? We can do this. Oh, totally. Previous TASKS completed include fairy-tale endings, electrocutions, cupcakes, history lessons, rare dinosaur-bird hybrid species discovered, pies faced, rock bands offered up and Christmas presents, presented. TASK has also served hors d'oeuvres, funked out a stilted disco and marshalled general fervor for social participation at various and sundry super-classy events. Currently, TASK is creating a clown telling of the Antoine de Saint-Exupery classic "The Little Prince" in conjunction with the University of Scranton. TASK's first (several) attempts at the wild feat of physical daring-do: a tightrope attached not to stationary architecture but to only the iron wills of men.